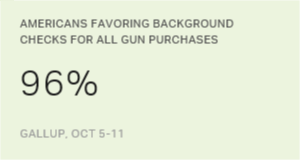 WASHINGTON, D.C. -- More than six in 10 (61%) U.S. registered voters say gun control is one of many important factors in choosing the candidate they vote for, up from 54% in 2015, the last time Gallup asked this question. At the same time, the percentage dismissing gun control entirely as a voting issue is at a new low of 12%. And nearly a quarter of U.S. registered voters, 24%, say they would vote only for a candidate who shares their views on gun control, basically unchanged from 2015. Thinking about how the gun issue might affect your vote for major offices, would you -- only vote for a candidate who shares your views on gun control, would you consider a candidate's position on gun control as just one of many important factors when voting or would you not consider gun control a major issue? These data come from Gallup's annual Crime survey, conducted Oct. 5-11. This was shortly after the Oct. 1 mass shooting in Las Vegas, the deadliest such shooting in U.S. history. Overall, 85% of registered voters now indicate that the gun issue will at least factor into their voting for major offices, the highest in Gallup's limited trend. 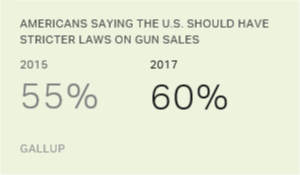 Gun control is just one of a number of issues that Americans have become more polarized about in recent years, with the gap in views on making gun laws stricter growing wider between Republicans and Democrats. Additionally, gun ownership varies significantly by political partisanship, with 43% of Republican registered voters and 16% of Democratic registered voters saying they own a gun. Despite having sharply diverging views on gun control and their differences in gun ownership, Republican and Democratic voters differ only marginally in how gun control issues would affect their vote. Somewhat larger differences emerge among political ideological groups more generally. Conservative voters are nine percentage points more likely than liberal voters to say a candidate must share their views, although liberals more than make up this difference in saying that gun control would be one of many factors they take into account. Moderate voters feel less intensely about the issue than either conservatives or liberals. Three in 10 (30%) gun owners who are registered to vote say they will vote only for a candidate who shares their views on gun control, compared with 20% of gun non-owners. The current views of both groups are similar to what they said in 2015. The importance of the issue to both groups' vote is up substantially from 2000, when 13% of gun owners and 10% of non-owners expressed this view. For more than eight in 10 U.S. registered voters, a candidate's position on gun control factors into their choice of candidate for major offices, although just one-quarter say they would vote only for a candidate who shares their views on guns. While Republican and Democratic voters have differing views on how stringent gun control should be in the U.S., their insistence that the candidates they vote for share these views is about the same. Gun owners are often portrayed as devoted, single-issue voters. However, the current data show gun-owning voters have only a 10-point edge over gun non-owners in their willingness to vote exclusively for a candidate who shares their views. Results for this Gallup poll are based on telephone interviews conducted Oct. 5-11, 2017, with a random sample of 890 adults, aged 18 and older, living in all 50 U.S. states and the District of Columbia who are registered to vote. For results based on the total sample of registered voters, the margin of sampling error is ±4 percentage points at the 95% confidence level. All reported margins of sampling error include computed design effects for weighting.